Everyone has a 9/11 story. Where they were, what they remember, forever singed in their brain. I was at home watching the Today Show. In fact, I was supposed to be on a plane to DC, but changed my flight to 9/12 a few days before. I watched with horror unfold as narrated by Matt Lauer and Katie Coric announcing to the world an "accident" of one plane crashing into the World Trade Center...and then a second plane. The day started out as what was thought to be a terrible accident and ended in an act of war. However, I neglected to tell my parents in Cleveland that my flight was changed. I had a horrible phone call with my mom, her voice alternating between relief and anger ... and fear. A week or so after 9/11, Americans were still not flying. Not traveling. Even though planes and transportation was starting to move again, people were not. A few weeks later, it was more of the same. People were still staying put, in shock of what had happened and how easily it occurred. I was online and I was offered an amazing deal...6 days and 5 nights in Las Vegas at the MGM Grand for under $250. Basically for the cost of a cheap flight I had a free room for a week. My friends and I thought we would get the economy going again and spend the Thanksgiving holiday in Vegas, or as my mom refers to it - the holiday I didn't come home. When my friends and I arrived, the first thing I noticed as how quiet it was. McCarran International Airport was a ghost town. There was no hustle. No bustle. Walking through the casino, there were no cheers from a jackpot or blackjack. The craps tables were silent. The workers everywhere from the small shops to the dealers all showed their concern. The Vegas strip is usually full of people laughing and joking. Instead it was filled with emptiness. People would excitedly chat with us, and then go back to looking desperately for the crowd that wasn't coming. As we walked down the strip, something was happening in front of the New York New York Casino. 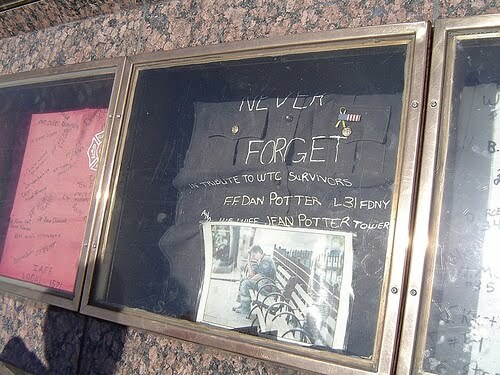 Firefighters and police officers from all over the world were leaving notes and their t-shirts in front of the NY cityscape. There were candles burning, letters to lost friends. I have never witnessed anything like it. My friends and I walked through in silence, trying to read everything...sometimes pointing something out. Men and women were openly crying, I know I had tears streaming down my face the entire time. 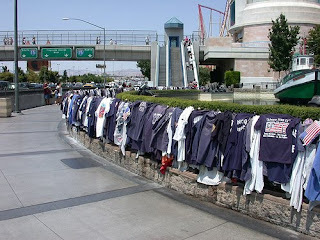 Since then, the casino has archived everything that was left behind and created a Hero's Tribute, rotating the items through their display like a museum. In the years since, I have returned to Vegas. I have even been to the Casino, but somehow, I haven't been able to look at the Tribute. Now, the items are in shadowbox cases, a few at a time, capturing a moment. A moment that I was there for...one that I don't need to see again.